Brazil announced this weekend it will recognize the leader of Venezuela’s National Assembly, Juan Guaidó, as the country’s new president, dismissing dictator Nicolás Maduro as illegitimate. Guaidó, a 35-year-old deputy from the left-leaning but anti-Maduro Popular Will party, was last week declared the interim President of Venezuela by the democratically elected National Assembly after Maduro was inaugurated for another six-year term. Maduro “won” that term in an election where the government banned opposition figures from running and the population refused to vote, yielding record low turnout. Considering that on January 10, 2019, Nicolás Maduro did not meet the demands of the Lima Group expressed in its January 4 Declaration, and so began a new illegitimate presidential term, Brazil reiterates its full support for the National Assembly, a democratically elected constitutional institution, at present responsible for the executive power in Venezuela according to the country’s legitimate Supreme Court of Justice. “Brazil confirms its commitment to continue to work for the reestablishment of democracy and the rule of law in Venezuela and will continue to coordinate with all actors committed to the freedom of the Venezuelan people,” they continued. The United States backed the sentiment. State Department deputy spokesman Robert Palladino called on the Venezuelan military, the most important backers of the Maduro regime, to accept Guaidó as the constitutional leader. “We commend the courage of the National Assembly’s leadership, particularly its president, Juan Guaidó, and his decision to invoke the authorities of the Venezuelan Constitution,” he said in a statement. “We call on all Venezuelans to uphold and respect the role of the National Assembly, as established in the Venezuelan Constitution of 1999, and, in particular, for the security forces and the armed forces to respect all protections the constitution affords to Guaidó and the other members of the National Assembly, especially their safety and welfare,” he continued. International recognition of Guaidó as the rightful President of Venezuela is likely to infuriate the Maduro regime, which has brought the country under the control of Cuba’s Castro regime. Scores of democratic nations across Latin America and around the world have already said they no longer recognize Maduro as a legitimate president, in large part because many of his leftist allies have been replaced by conservative administrations. 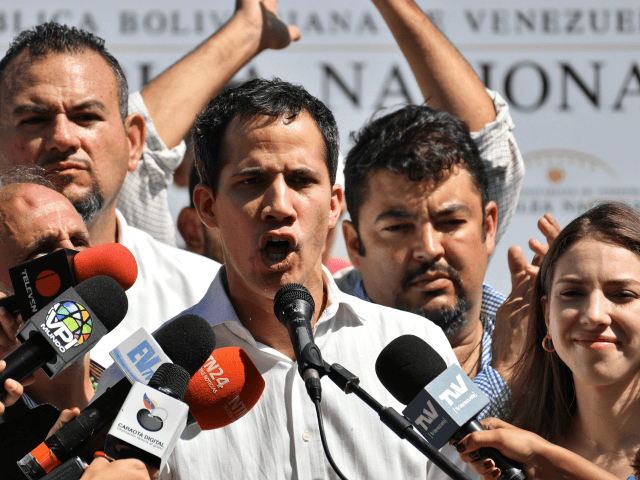 On Sunday, members of Venezuela’s National Bolivarian Intelligence Agency (Sebin), the nation’s secret police, arrested Guaidó on the motorway as he was traveling to a rally, but released him shortly afterward. After making it to the rally, he urged supporters to focus more on solving the country’s deepening economic and humanitarian crisis than his own welfare.